Our story is as big as the beers we brew. Our tale began when entrepreneurial Carlson and Czaplicka families signed the deed to the historic, century-old Old German Restaurant in downtown Ann Arbor, MI. Within its dark, den-like interior the Grizzly Peak Brewing Company arose in 1995, where brews (created by Master Brewers Mike Hall and Ron Jeffries) and food of uncommon quality were the focus. As the days passed into years, their passion for brewing grew and led them to forage for other like-minded individuals. The result of this hunt led Grizzly Peak Brewing Company’s Jon Carlson back to Ron Jeffries who had gone on to found Jolly Pumpkin Artisan Ales. Together, with Greg Lobdell and Chet Czaplicka, they spawned Northern United Brewing Company in 2008. Their mission was simple: take the legendary name of Grizzly Peak (already with years of trophies sitting on the mantel) and build upon it with high-gravity craft beers of the finest, hand-made quality using ingredients harvested from Michigan soil. This is why Grizzly Peak brews whenever possible with Michigan malted-grain, hops and water. Over the next six years, Ron collaborated on recipes with Mike Hall and Duncan Williams that drew from their nearly 75 years of combined brewing experience. In the spring of 2014, at their new, secluded state-of-the art brewing facility in Dexter, MI, the first bottles of Hellion Double IPA rolled off the bottling line. Berserker Heavy Duty Ale, Humungous Imperial Red, and soon to be named Imperial Stout will follow in 2014. 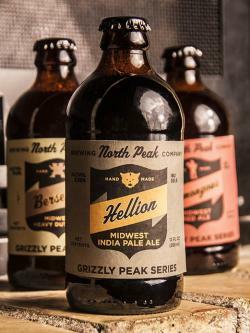 Grizzly Peak beers are brewed in Michigan. Using ingredients grown in Michigan.